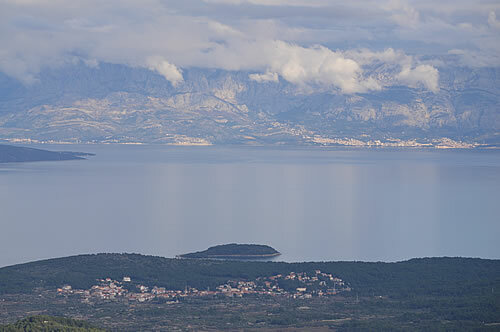 From our visit up to Sveti Nikola, the highest peak on the island, on the way down we followed the road towards Svirče. Now I have to say that your modern small car is not best suited to the island’s backroads. It simply doesn’t have the clearance of, say, an old Renault 4 which is a much coveted vehicle in these parts. But, we managed with some careful avoidance of the worst potholes! Heading down from the summit, the views are just breathtaking. The mainland is wonderfully clear, despite the overhanging clouds. And look at the reflections in the sea! The ridge of the island is not as sharp as you’d expect, looking from below. 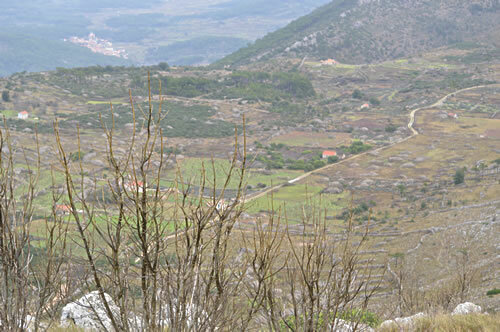 There’s actually a fairly wide plateau, just down from the summit, with green fields and red-roofed farm buildings. From above, we can see our road snaking across the plateau. 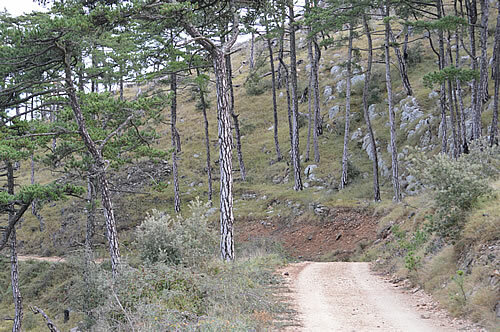 The road takes us down past a stand of black pine. In the fields, there’s not much evidence of activity today, but clearly fields are tended and buildings kept in repair – mostly. There are lavender fields, with their neat, tidy mounds, and we find a traditional trim in use for storage. 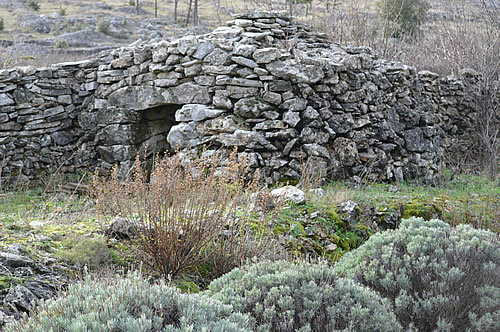 It’s always hard to tell how old these traditional stone shelters are, as the same construction has been used for centuries. This one has clearly been here for some time. The more modern version, though still beautifully traditional is the rectangular stone building with green shutters and a red tiled roof. It fits into this environment so naturally, adding a wonderful highlight to my photograph! The road is hemmed in by drystone walls, just wide enough for a single car. I wondered what we would do if we met someone coming the other way! Thankfully, we had the entire island, so it seemed, to ourselves. There seems to be an entire farmstead up here, though I’m not sure anyone actually lives here year round. What a gorgeous location with stunning views! 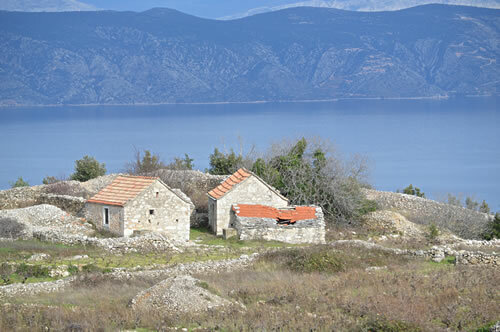 That’s the island of Brač behind. There are vineyards up here, too. 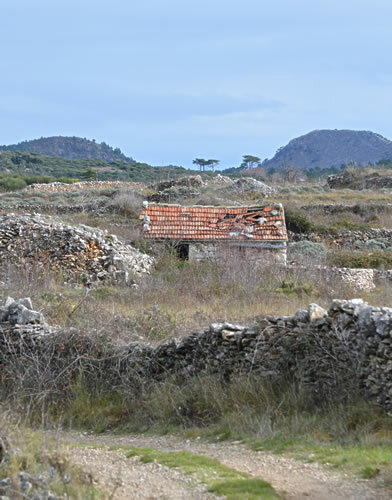 The ones we saw appear to be newly planted in small fields, making use of stone walls to protect against the wind. A sharp left turn from the plateau takes us downhill through a steep-sided canyon. In wet weather this is probably the path of a seasonal stream. 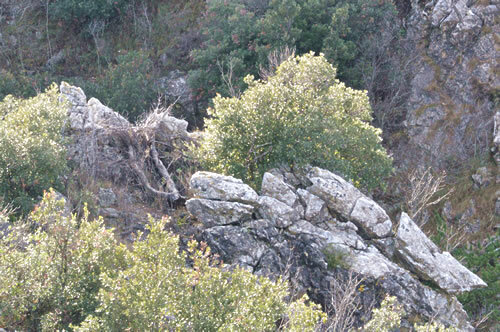 It’s rather wild, very pretty, with the green of the pine and splashes of yellow broom. 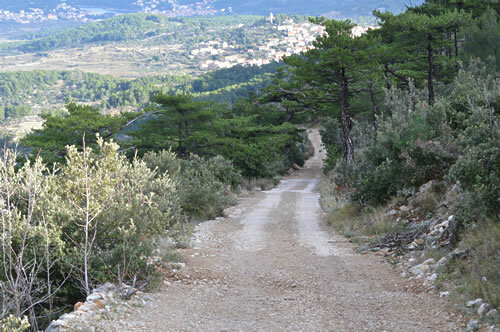 A couple of tight hairpin bends drop us sharply down into the heart of Hvar’s wine country. 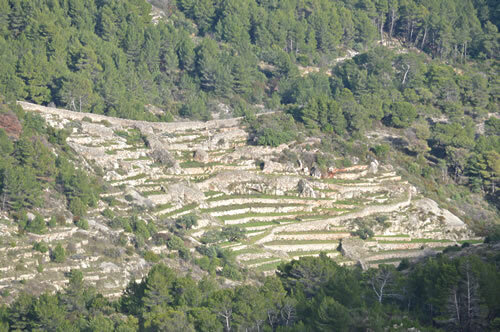 As we emerge from the canyon, we have the amazing sight of an amphitheatre vineyard! 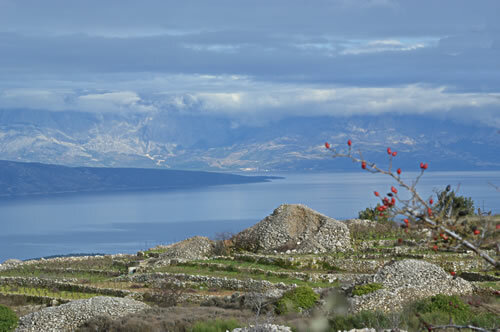 This is Dubje, where Plančić winery grows its very best wine, the Grand Cru. 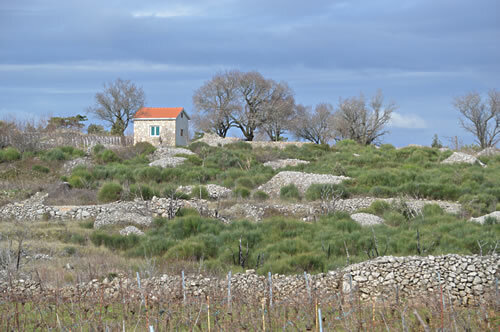 Steeply terraced and south facing, this vineyard produces one of Hvar’s finest wines, and wow, what a stunning location! Our road continues down, with views of Vrisnik ahead, though that’s not where we’re going today. Surprisingly, the track is getting somewhat rougher, the closer we get to the villages. More lavender terraces here, too. 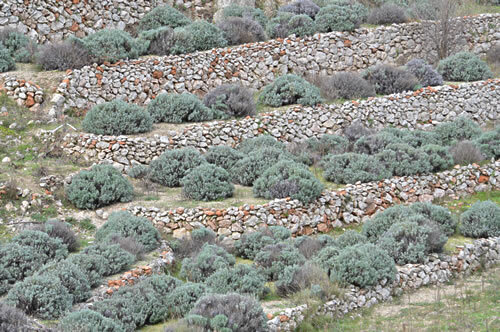 Everything planted on these slopes has to be supported by drystone walls. 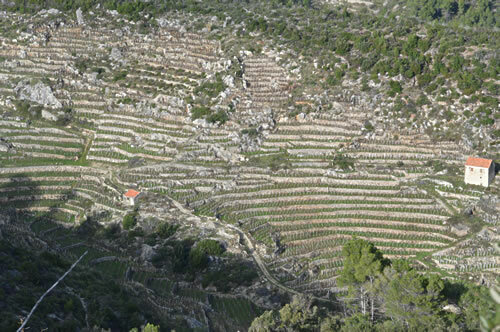 There are some fine terraced vineyards in this valley. They face south for maximum sunshine and for protection against the cold winter bura. And now we can see Svirče ahead, with that distinctive domed church. 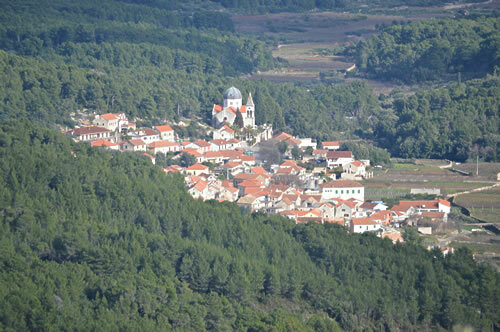 This is the heart of Hvar’s wine country, and we enter the village past the PZ Svirče wine cooperative, and Carić winery.